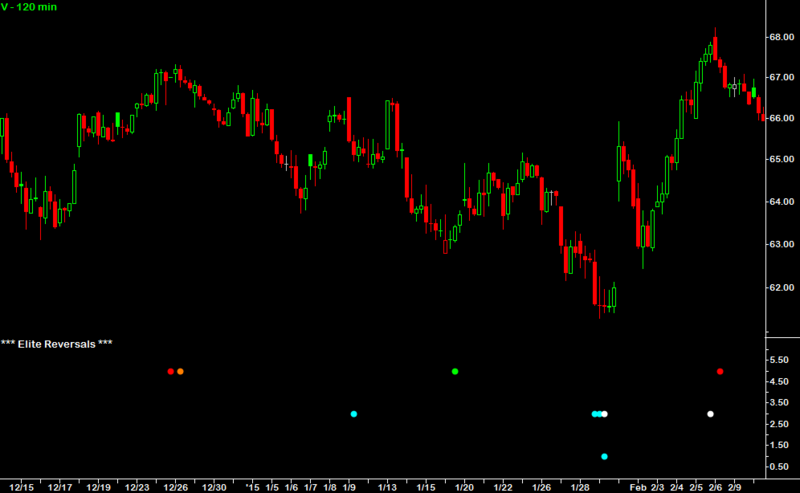 Already own the Elite Trader Package? Enter promo code "Elite-Owner" at checkout and save $500! 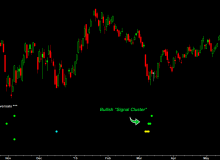 The most powerful trading Indicator that we have ever released, the Elite Reversals™ plots reversal signals from ALL of the Elite Indicators simultaneously. 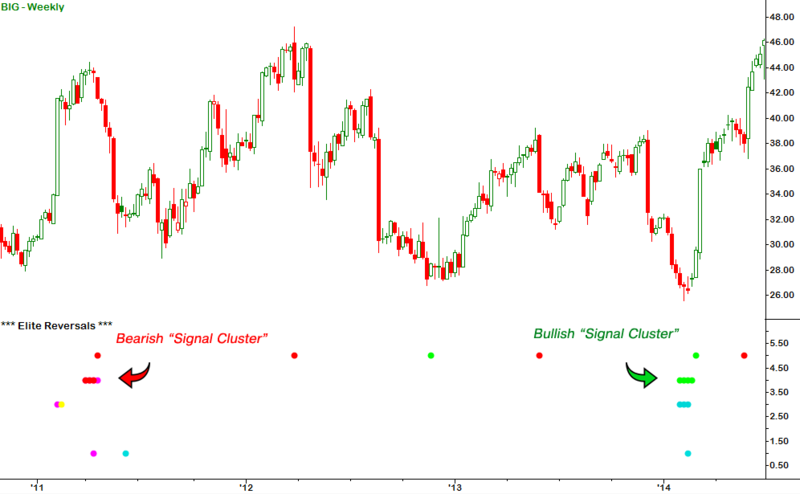 It predicts market tops/bottoms and major price reversals with remarkable accuracy by identifying "signal clusters" — areas where reversal signals trigger across 2 or more Elite Indicators. 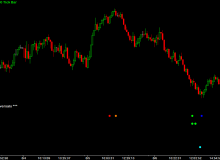 When this occurs and several "reversal-based" algorithms are in agreement, the likelihood of a price reversal skyrockets — giving you high-probability trade setups that offer huge risk:reward ratios! 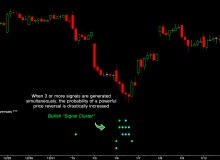 You can use the Elite Reversals™ Indicator to find the best buy and sell signals that the market has to offer — across all instruments, interval periods, and chart types! 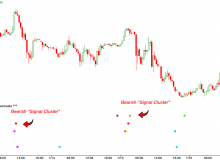 What makes Signal Clusters so Accurate? 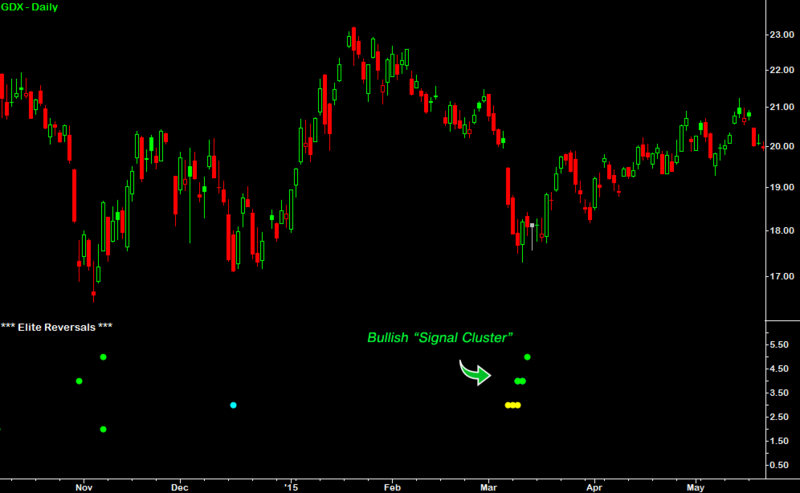 Signal Clusters occur when reversal signals trigger across 2 or more Elite Indicators at once — producing some of the strongest and most accurate reversal signals possible. 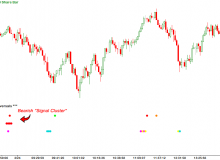 When this occurs, the likelihood of a price reversal skyrockets because several reversal-based algorithms are predicting the same thing — they are in harmony with each other. 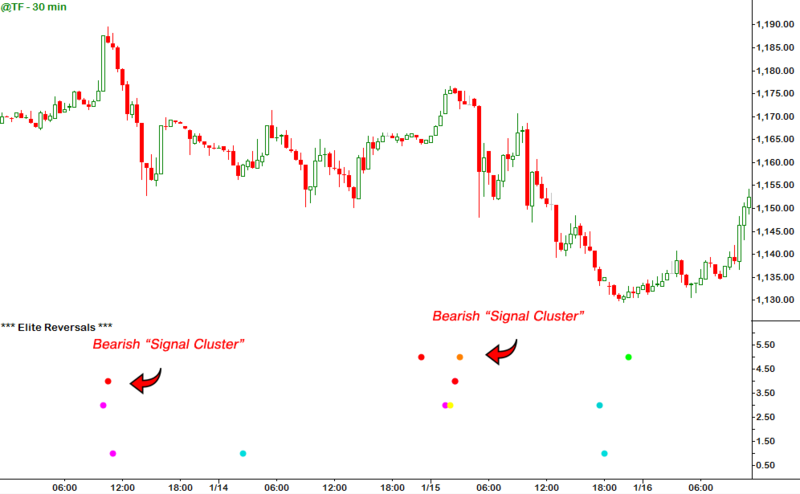 And since each algorithm is unique and there is no overlap between them, it's not just a coincidence when a Signal Cluster occurs... it's a big deal. 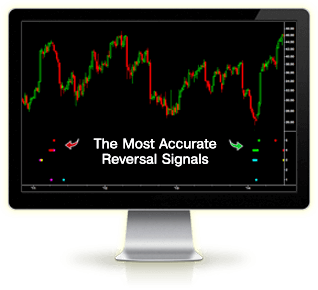 As each price bar plots, the Elite Reversals™ cycles through 12 different algorithms to calculate the probability of a reversal. 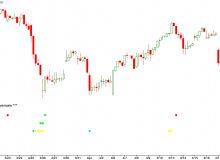 This multi-tiered approach produces the best buy and sell signals that the market has to offer — across all instruments, interval periods, and chart types! 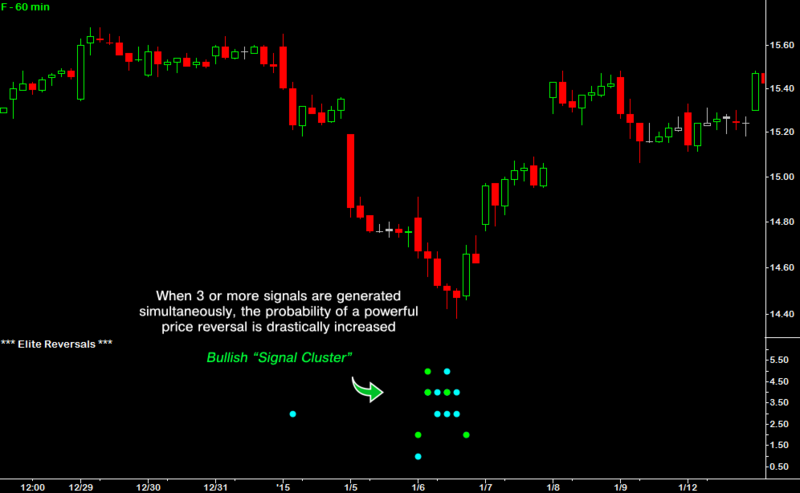 Not only are Signal Clusters remarkably accurate, but they also offer huge profit potential because they catch the biggest price reversals at their start — sometimes even before a move begins! 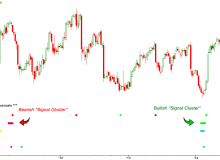 When reversal signals trigger across 2 or more Elite Indicators, the likelihood of a price reversal skyrockets because there is confluence between multiple reversal-based algorithms. 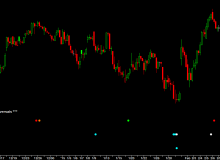 The reversal signals are extremely accurate across all interval periods of time, tick, and volume — as well as alternative chart types like Renko, Range, and Kase Bars. The Elite Reversals™ has alerts that can be configured to trigger audio sounds, pop-up windows, and email notifications! 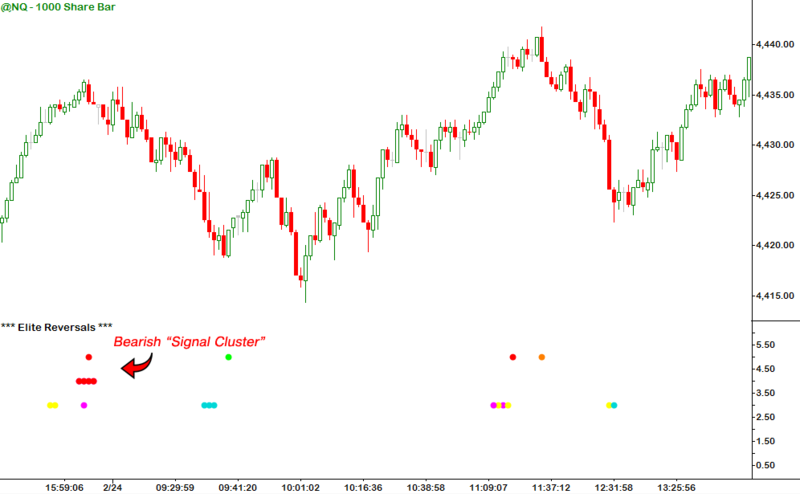 Alerts are triggered when there is a "Signal Cluster" (multiple reversal signals). 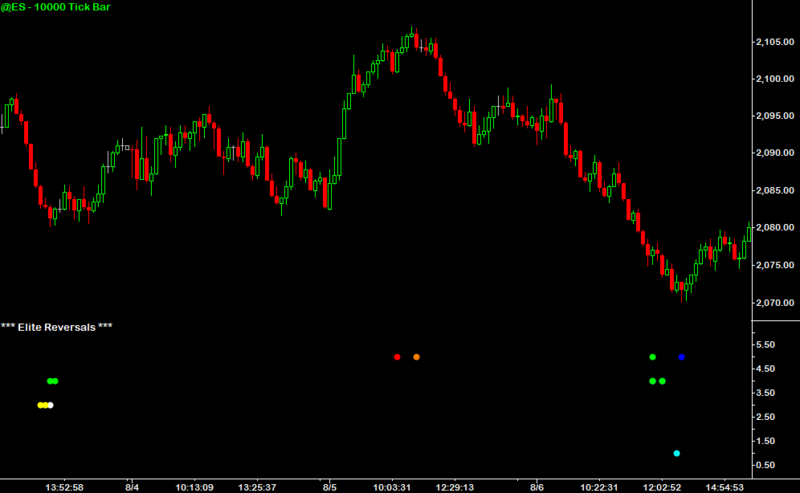 The Elite Reversals is included as a bonus with your 30-Day Demo of the Elite Indicators! Click Here to Start Your 30-Day Demo! You can exchange the Elite Reversals for multiple Indicator Packages of equal or lesser value — up to 30 days after purchase! 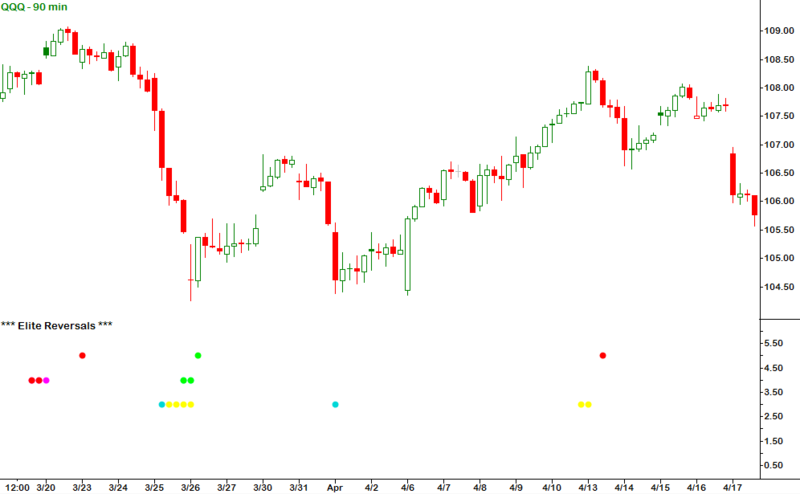 Have a question about the Elite Reversals™ Indicator? Check out the Elite Reversals™ User Guide to learn more!